Biography: Carlos Vela y Aulesa (Barcelona, 1969) es profesor de Historia medieval en la Universidad de Girona. Desde 1993 está vinculado a la Institución Milá y Fontanals, del Consejo Superior de Investigaciones Científicas. Ha publicado varios trabajos sobre los especieros y candeleros de cera en la Barcelona medieval desde diversas perspectivas, entre los que destaca El obrador de un boticario medieval según el libro de cuentas de Francisco s es Cannes (Barcelona, 1.378 a 1.381) (Institución Milà i Fontanals. CSIC, Barcelona, 2003) y varios artículos sobre las ordenanzas municipales relativas al comercio de especias, drogas y cera. 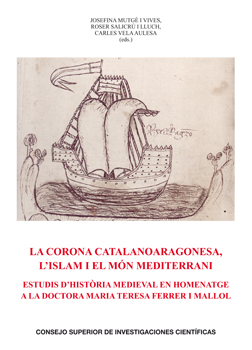 This book brings together work by over seventy outstanding, internationally-renowned medievalists as a tribute to the Catalan historian Maria Teresa Ferrer i Mallol, following her retirement as Professor of Research of the CSIC's Institución Milá y Fontanals in Barcelona. The studies published in this volume mainly revolve around issues concerning Catalonia, the Crown of Aragon, and the Iberian Peninsula and the Mediterranean in the medieval period. The volume is preceded by a list of all the publications by Maria Teresa Ferrer i Mallol from her earliest work (1963) down to the present (2011), with an extensive tabula gratulatoria, highlighting the strength and visibility of her research at both the national and international levels. The compilers and editors of this volume, Josefina Mutge y Vives, Roser Salicru i Lluch and Carlos Vela Aulesa, have had a long-standing association with Dr. Maria Teresa Ferrer i Mallol, first as roommates and later as disciples, and have worked for many years at the CSIC's Institution i Fontanals Mila in Barcelona, where they have carried out their research in medieval history in the framework of the consolidated research group coordinated by Dr. Ferrer i Mallol. This book was added to our online catalog on Monday 10 June, 2013.